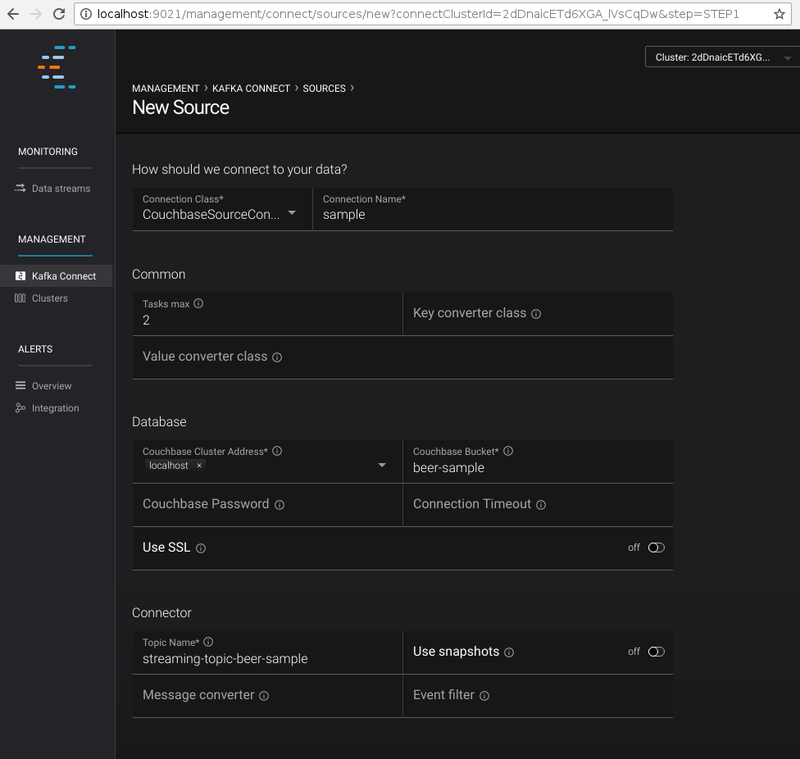 Sample application which uses Couchbase connector with Kafka Streams. # For RPM/DEB based Confluent Platform deployments the paths might be absolute. The full code of this sample is accessible in the connector repository at src/test/java/examples/KafkaStreamsDemo.java. The main function of the KafkaStreamsDemo class starts with loading the MySQL driver, establishing connection and preparing insert statements for both kinds of the documents: brewery and beer. The next block supplies the Streams configuration. Along with endpoints, it sets serializers and deserializers for keys and values, which appear in the Kafka topics. These values are written by the Couchbase connector. Here we use simple classes src/test/java/examples/serde/KeyAvroSerde.java and src/test/java/examples/serde/ValueAvroSerde.java, which do not make assumptions about the document body, but the real application might implement serdes, working with more specific classes. We start constructing the source stream by pulling data from the Kafka topic streaming-topic-beer-sample. The first step in our pipeline would be to extract content from the Couchbase event and deserialize it as JSON, as Couchbase operates with JSON documents normally, and in beer-sample bucket in particular. With branch operator, we split stream into two by the document type, and in the same type we filter out documents that don’t have all the fields we want to insert into the MySQL database. Once the documents are extracted and filtered we are ready to insert them into the MySQL database using statements prepared earlier. Note that inserted records are using the document ID from Couchbase, which means that records will be updated in place automatically without creating duplicates. This example does not handle document deletions or expiration, but it won’t be complex to do with an additional stream that executes DELETE statements. The last step is to execute the whole pipeline. 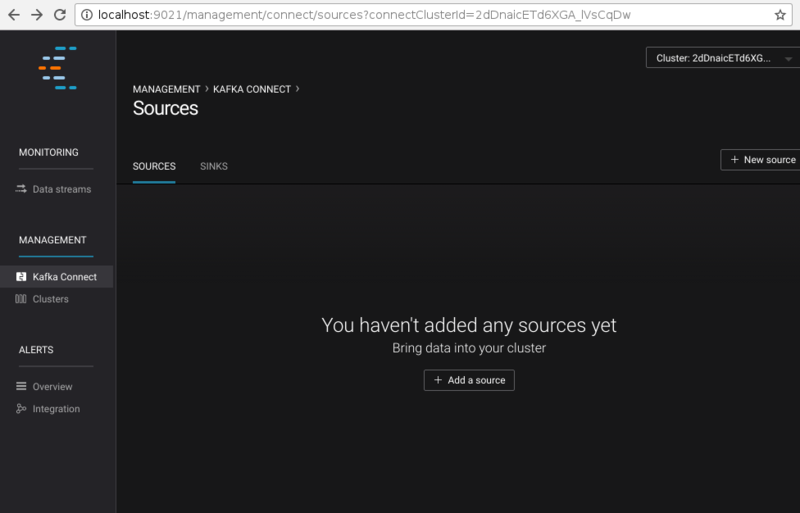 We start by setting up the connector to relay the bucket contents into the Kafka topic streaming-topic-beer-sample. It could be done either using property files and connect-standalone as in Quickstart, using REST interface of connect-distributed or using Web UI provided by Control Center. We will use the last two options. Submitting the form (or using a REST call) will register the new Connector link and start it immediately. The records will start filling the beers and breweries tables.